A cool mass of air will drop from the Arctic regions to Canada and then to the upper Midwest in the coming days, according to the National Weather Service. 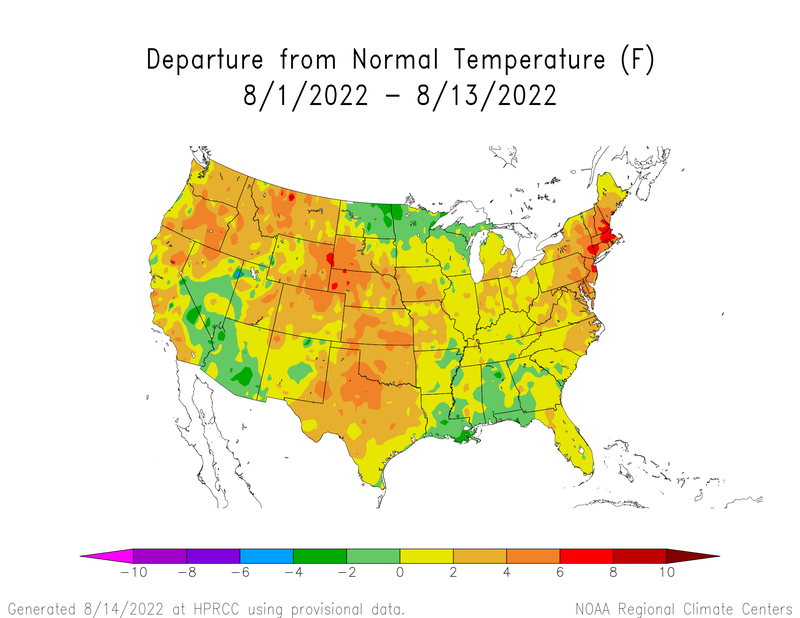 With temperatures forecast to be roughly 10 to as much as 30 degrees below average, thermometers across the Midwest could drop into the 50s and 60s instead of the usual 80s and 90s at this time of year. The unseasonably chilly air may even move into parts of the northern and northeastern United States, including New York and Washington, D.C. In Chicago, overnight lows could reach the low 50s downtown and sink into the low 40s further away from the city on Tuesday and Wednesday, according to Mark Ratzer, a meteorologist with the National Weather Service in Romeoville. It’s possible the city could reach record lows for July, Ratzer said, though he cautioned the forecast could change before then. “Temperatures in the far northern Plains into the upper Midwest might even flirt with the low-40s, possibly even into the upper-30s if there will be clear skies,” warns weathercentre. This will bear “a haunting resemblance to January’s brutally cold weather pattern,” says the Washington Post. Indeed, several National Weather Service offices are calling this a “polar vortex” event. However, many meteorologists disagree with that terminology. “I, for one, am greatly enjoying this,” says Alan. Nooo, not again! This is what happened last summer. I live in the NYC area and last year in the middle of July it turned cold and rainy with temps in the 50s. Wonderful week for vacation. For the rest of the summer after that it never got much above the mid 70s and it felt like fall. Not really great beach weather. 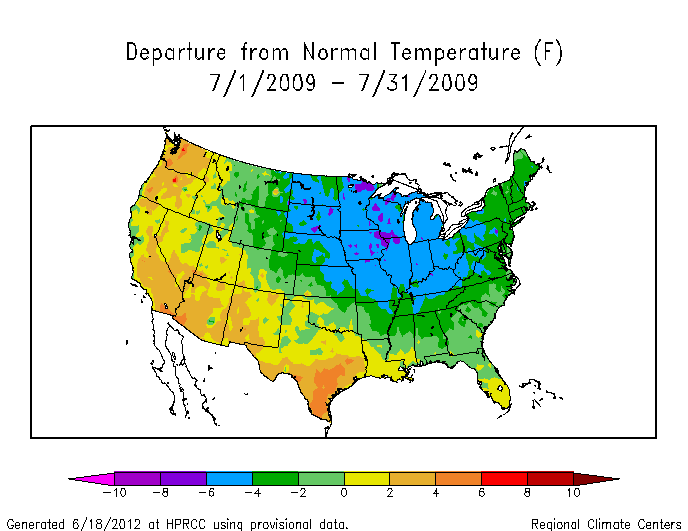 A continuing string of ever colder Springs and cooler Summers – seems like a pattern. I hate to think of what this winter will bring. It has been quite cool here in Northern Wisconsin for July. Maybe a sign of things to come. I guess 97 percent of our readers will agree it is the Gore effect. Al Gore came back to the States after his visit to Australia, that must be it. nof mine over there wont be so happy. This is terrible news. The map covers a substantial part of the corn belt where temperatures above 80 degF are needed during much of July and August. Globally the price of food will take a big hit. Have a look at the Chicago futures market for soybeans and pork bellies. Corn and Soybeans are doing just fine this year. It isn’t a polar vortex. I’m certain it’s caused by global warming. Is AlGore appearing somewhere in the midwest? With expected surface low of 984mb, it definitely qualify polar vortex.With sun’s UV rays weaking and high latitute volcanic eruptions, one can expect bigger and more frequent polar vortexes in midwest. The only reason for MSM characterizing this new trend as the “poor man’s” Polar Vortex is that there is no funding, seed money, stipends, fees, levies, taxes, or cap and trade on Global Cooling aka the next Dalton/Maunder Minimum. Unfortunately, this is simply the harbinger of a 2014/15 Winter that will be even colder, more persistent, and with more Blizzards and fresh water freeze over than this last Winter’s experience. I think they are hinting to being poor due to a lack of man made Global Warming funding. Remember Akademik Školaski and the AAE? They need to next travel to Lake Superior and study the effects of AGW on ice flows this coming January. Another rescue mission would make for good headlines, increased readership, and advertisement revenue growth. LOL. Hopefully this will not be taken seriously (the warming that is). I know in the Eastern US the (Polar Vortex)of last winter lasted several weeks, how long is this cold spell suppose to last. Could this be similar to the year without a summer? Year without a Summer? Not this time. year w/o summer needs a big Volcano(think Pinatubo/Krakatoa/Katla/Yellowstone). Sorry Wayne you are below the bubble of cold, give it a while, probably another year I would say. Global Warming Science: As CO2 levels rise, the Earth’s temperature will rise, irrespective of any other factors. Reality: CO2 levels have risen over the last 20 years and we keep getting colder. Some other factors may be in play. Do believe that Co2 always lags the cooling, so, that being true and more volcanic eruptions non-stop now Brrrr!! Or the simpler explanation: Global Warming Science is WRONG! Ice remained on Lake Superior into June! This summer has been pretty tame here in N. Phx.. Where it cools off much quicker than normal in the PM. Before the monsoons, it was cool in the AM. Very unusual.. Same here in northern Nevada. Warm during the day and cool at night. Even cooler at Lake Tahoe during the night. on a message board i frequent, i’m the resident denier and troll because i put up stories like this. unfortunately, i’ll always be the troll/denier because the owner of the blog is a PHD phyicist, so he cannot be wrong as smartest person on the blog. despite living in chicago and suffering through the coldest winter in its history, he’s still right. if the solar minimum continues and really picks up speed over the next few years, i’m demanding a blog apology from him. Admit you’re a “denier” proudly because “deniers” have to think for themselves to be able to raise any argument that goes against the “herd” belief. Start calling the unthinking believers “gullibles” for that is what you must be to unthinkingly accept a scam ! This summer has been pretty tame here in N. Phx.. Where it cools off much quicker than normal in the PM. Before the monsoons, it was much cooler in the AM than previous years. Very unusual..
Could we end up with a summer like 2009? It was pretty cool that month in the Midwest. Lots of records broken then. Not a polar vortex, but a Classic buckle in the jetstream due to Meridional Flow, which is due to a quiet Sun. Solar wind speed has been consistently below 400 KM/sec for at least a week, perhaps longer. AHA! I should’ve known as we are expecting much above normal temps here in Oregon! There has been a high pressure all winter long in the Central Pacific that has been the most contributor last winter and is likely again this upcoming winter 2014-15. I read a sight that showed all the Telecommunications describing what ones were contributing and interestingly enough neither the NAO/PDO or others were doing anything. It was all related to the Central PAC warming shifting storms far north then diving them back south thru the Midwest! I can’t help but wonder if this Central PAC warming is HARRP’s doing or something the sun is burping up? Al gore should come up to Portland and cool things off!